There is something to driving electric that is more than the sum of its parts. Sure, they are faster (generally), they are quieter, you don’t have to breath dangerous chemicals to make them go, and there is some comfort in the fact that if you accidentally fall asleep in your car while parked in the garage, you actually will wake up. Most electric cars are smarter than their smoking hillbilly cousins and they are definitely cheaper to drive. Want to pay a dollar for gas...drive electric. Want to never again spend $129.00 dollars on an oil change, oil filter, and air filter again...drive electric. Tired of waiting for your car as your mechanic finishes that brake job on your 3 year old car... drive electric. Plus, you might experience what I experienced several months ago. I was driving east on Hwy 290, a little faster than the speed limit, when this huge “dually” truck (four tires on the rear axle) comes roaring around me. It’s a real fancy black truck with shiny dual vertical chrome exhaust pipes running up on both sides of the cabin. There was probably some stickers that I didn’t read but I suspect that the long-haired driver was a member of a political class that rhymes with bumper. So this guy passes me, then abruptly slows down in front of me. Then, with the flick of some switch, he zooms off leaving a huge noxious black cloud of smoke in his tracks, with me in those tracks...I mean thick black smoke like a locomotive in a western movie. And yes, that is a thing. Surely, I deserved it in his eyes, I was driving the fastest, smartest car on the road in my judgment, and he needed to communicate his unhappiness with that. It was a first amendment thing. So watch out for those smokers. Personally, I’m on my second electric car. The one I have now is all electric, and the one I had before was a plug-in hybrid. The plug-in hybrid went about 40 miles on electric fuel, and then if I needed to travel, the on-board generator would kick in. There was zero range anxiety and as a cultural transition vehicle, it is pretty smart. A plug-in hybrid embodies the 80/20 rule quite nicely. With 80% of trips under 40 miles, then make those emission free trips. When you drive to Memphis, do that with gas. I don’t have that option with my “S”. If I’m traveling out of town, I need to do a little planning. Fortunately, the computer makes that easy. One night I got down to about 25 miles before I pulled into the high-speed charger behind the discount mall at mile 202. Within a few minutes, I had 120 miles again, and Austin was only 30 miles away. Most of the time I charge overnight and wake up to a car that is almost always full and ready to go. But electric driving is different. You don’t think of getting a fill-up. You think of getting home. Because, unlike a gas car, you get most of your “go” at home. Electric Car sales are gearing up so to speak. 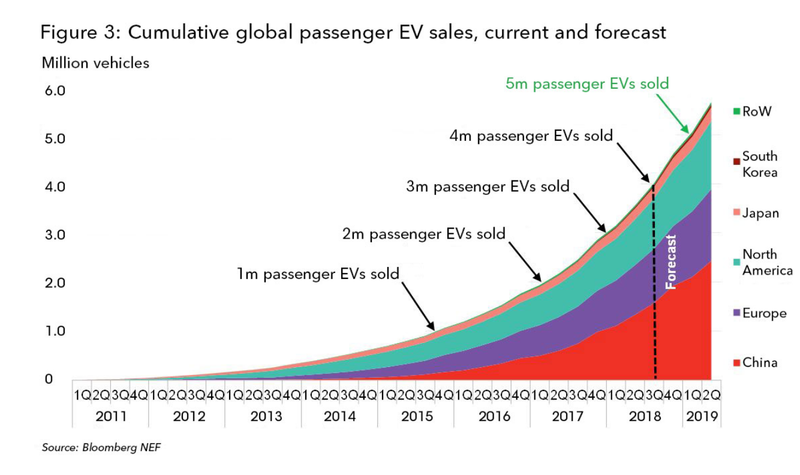 According to Bloomberg New Energy Finance, “cumulative passenger EV sales worldwide are set to hit 4 million this week. Including electric buses, the 4 million threshold has already been reached. At the end of June, there were more than 3.5 million passenger EVs sold globally and about 421,000 electric buses, bringing the total number of EVs sold to 3.97 million. "Setting e-buses aside, we expect cumulative passenger EV sales to reach 4 million units before the start of September 2018. There are several new EV models that we expect to come to the market before the end of 2018, which should help increase sales numbers globally. 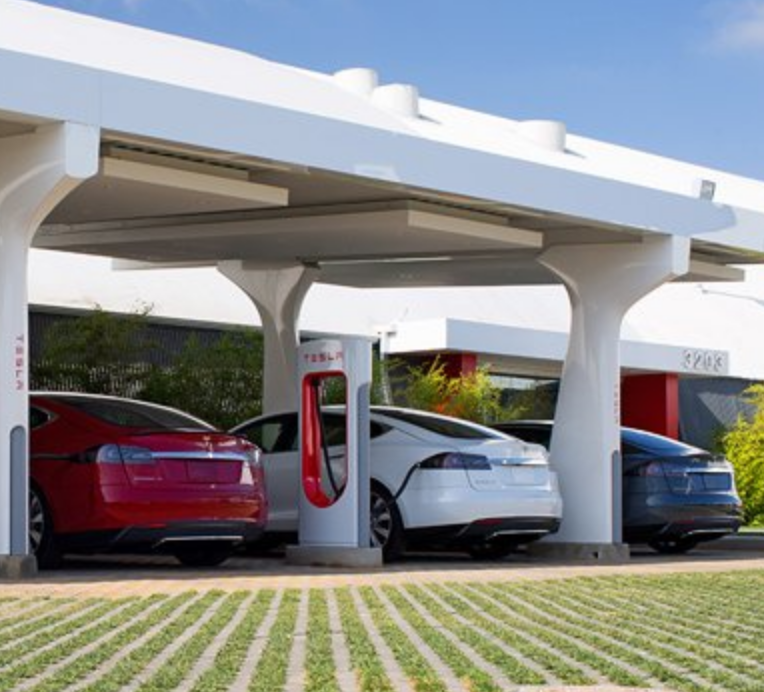 The next million EVs will take just over 6 months. We expect the five-millionth EV to be sold in March 2019." There is a professor at Texas A & M who considers himself an electric car expert. He doesn’t believe that we will ever replace the advanced gasoline cars of today because they are just so good. He also doesn’t drive an electric car. He also doesn’t believe that climate change is a transcendent problem. That in order to get the carbon out of our world, we will need to run our cars on wind and solar. And with enough electric cars, we will have enough stored energy to do it. Driving Electric is more than the sum of its parts, because electric transportation is the building block to a carbon-free world. September is a good a time to start because it’s Drive Electric Week from the 8th to the 16th. Here in Texas, there will be events in Houston, Dallas-Fort Worth, Corpus Christi, San Antonio, and Austin. The Dallas event is in Grapevine on Sept 8th, and the Austin event is on the 15th. Join us in Austin on Electric Drive Saturday, September 15th, and climb into the driver’s seat of the newest electric vehicles available. There will also be the latest scooters, motorcycles, mopeds, buses, skateboards and bikes. Grab lunch from one of our food trucks and enjoy the live music, workshops and activities for kids! Sponsored locally by Public Citizen, the Texas Electric Transportation Resources Alliance (TxETRA), Austin Energy, and SmartCharge America, it might be your opportunity to become part of the solution. Hopefully, it will help keep us all from getting “smoked”.